Stella Arnaldo's Blogspot: One more day to file your ITR! I ALWAYS get stressed filing my annual income tax return. 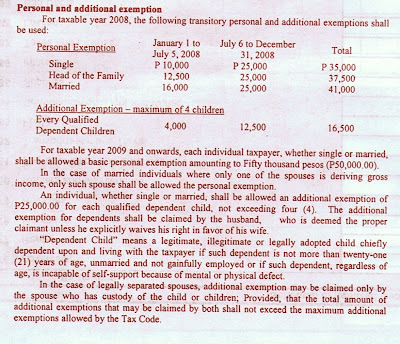 In the first place, the forms from the Bureau of Internal Revenue (BIR) have never been easy to understand and fill in. Being poor in Math also adds to my befuddlement. I have to check and re-check, and yet once more, to make sure I'm not overpaying the government. Not everyone can afford a tax attorney or an accountant to do these things for you. And yet I persist. Even though I don't agree with the politics and behavior of the present occupants of Malacañang and we don't get the full benefits from paying our taxes, which likely end up in the pockets of the kawatans in government, I still believe it's our civic and patriotic duty to pay our taxes and file our ITRs. Without our taxes, there will be no government services, poor that they are to begin with. And paying these taxes gives us that right to complain about how the government runs this country. But woe to the average taxpayer like me! This particular year, the BIR ITR forms are particularly confusing. (I use Form 1701 for self-employed individuals.) 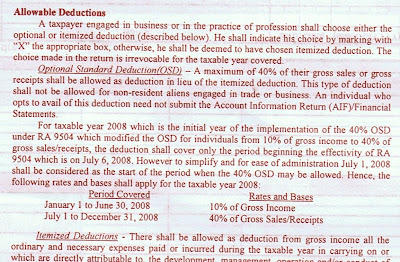 Just to clarify, the ITR we are filing this year, covers the income and taxes paid in 2008. But the problem is, the Form 1701 issued now, already reflects the revisions to be used when we file our ITR next year (covering 2009 income and taxes). It's confusing because the instructions at refer to the 2008 taxable year. For instance, when you file your ITR next year, you only choose from two exemptions statuses: single and married. Both receive a whopping P50,000 in deductions from your taxes. Form 1701 already reflects this and so there are only two boxes to choose from. But like I said, we're still filing for the 2008 income/taxes. So the form should clearly have three personal exemption boxes: Single, Head of Family, and Married, as it says so in the instructions at the back. So should I follow the instructions at the back of the sheet w/c are clearly the correct ones? OR should I just fill up what's on the form itself even if incorrect? Kakainis! With this kind of confusing BIR forms, you can just imagine why a lot of people avoid filing their ITRs. Oh, and how can BIR encourage more people to pay their income taxes and file their ITRs when the first thing the staff will tell you is, "we can only give you three copies, kasi limited ang forms"? E pano kung maraming gusto mag-file? Di wala na kayong forms? Tsk, tsk, tsk. What is admirable though is that at least, for the past years that I've been doing my own taxes, I've seen the BIR personnel station themselves in the malls to be more accessible to the taxpayers. So you can get the ITR forms from them, or submit your completed ITR to them. If you need to pay anything, go to LandBank or other accredited agent banks (ask your bank). Or go to your respective BIR offices. According to BIR spokesperson Ms. Aida Simborio, you have until July 15 to pay your income tax. But you still need to file your ITR by April 15, tomorrow. I think I will badgering her again later to explain the discrepancies in the form. For those seeking information about how to file your ITR, check the BIR web site for more details. 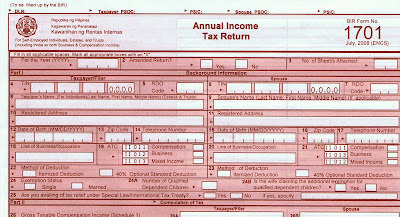 ITR forms are downloadable from the site. (UPDATE 11 am) After checking in w/ Ms. Aida this morning, she said apparently I'm correct. The forms the agency issued are for next year's filing. Ah well, too late to recall the forms now. Tsk, tsk.